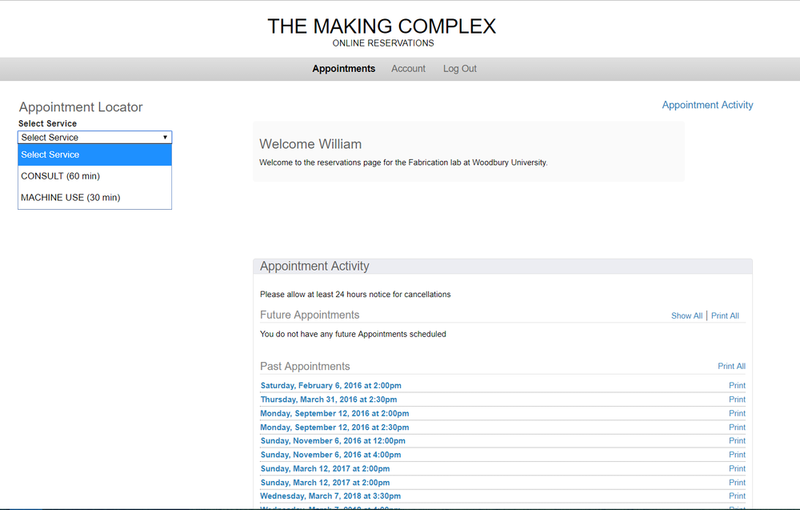 The MC provides the Woodbury University community access to a multitude of fabrication resources. Among the long list of machines, the following are exclusively accessed by first making an appointment. MACHINE USE - Students who have taken the Laser Cutter safety orientation are free to schedule their own appointments to use the machines. This is not the case for the remaining tools. CONSULT - There are three types of consultations; 3D Printer, CNC Router, CNC Mill. The consultation appointment gives the students the opportunity to have a meeting with an MC staff member. In this meeting, they will briefly review the student's file and submission form. In the case of the 3D Printers, upon completion of the consult the student's file will be added to the print queue. As for the CNC Routers and Mill, the consult will end with the staff member scheduling a special Machine Use appointment. 5. Select date. Software only shows one week into the future. 6. Select desired day and time. Once your appointment has been finalized, you will receive an immediate email confirmation and email reminder the day of. Only one CONSULT appointment can be made per day. Students are allowed a max of 1 hour per day and a max of 3 hours per week. Any student found taking advantage of this policy will be locked out of the system.